Cambridge Animal Health is a company that was established in 2013 for the purpose of developing a revolutionary non-surgical, safe, economical and permanent immunocontraceptive for cats & dogs of both sexes. The company has identified an opportunity to address the significant limitations of surgical and non-surgical alternatives to neutering cats and dogs. Based on an approach developed by one of its founders, the company plans to develop a non-surgical immunocontraceptive that will address the major requirements of pet owners, animal welfare charities and wildlife conservationists. Improve the welfare of both owned and unowned cats and dogs. 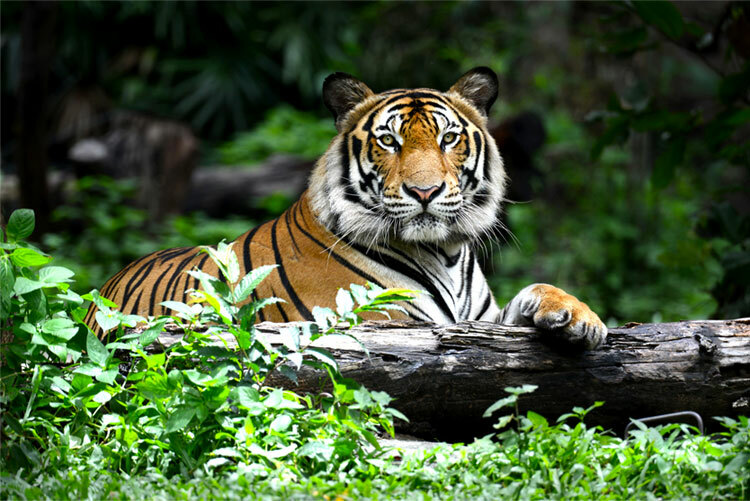 Work with charities and organizations to reduce the spread of zoonotic diseases from cats and dogs into humans and endangered wildlife species, as well as reducing the impact of predation by unowned cats on avian and small mammal populations. Jonathan Hay, JD PhD is a founder of Cambridge Animal Health. Jonathan is a Managing Director at Delin Capital, a private investment group. Jonathan holds an M.A. from Oxford University where he was a Rhodes Scholar, a J.D. from Harvard Law School and a PhD in mathematics from the Steklov Mathematical Institute. Professor Andy Peters, is Cambridge Animal Health’s Chairman. Andy is Director of ARPEXAS Ltd., a UK based consultancy providing strategic and technical support to the animal health sector in new product development, with special emphasis on vaccines, diagnostics and reproductive management. He is also Assistant Principal, Scotland’s Rural College. Until December 2005 he was Head of European Vaccine R&D with Pfizer Animal Health. Between 1993 and 1998 he was Professor of Animal Health and Production at the Royal Veterinary College, London and previously Regulatory Manager with Hoechst Animal Health. He is a veterinarian with PhD and DSc degrees in animal science, a member of several government advisory committees and has published some 160 scientific papers and two books on Vaccines for Veterinary Applications and Reproduction in Cattle respectively. Andy has worked for many years in the field of reproductive endocrinology. Gerard Harper, is Cambridge Animal Health’s Chief Financial Officer. Gerard is a strategy consultant working with a portfolio of companies in their pre-revenue and growth phases. His career spans over 20 years with international experience in building successful companies and brands. He was Investment Manager at NBGI Ventures where he worked closely with innovative medical technology companies across Europe and the US. Prior to this he was an Investment Banker with Nomura working in the corporate finance team focused on the small to midcap European healthcare and cleantech sectors. Gerard has extensive consulting experience with the pharmaceutical industry and holds a BSc in Pharmacology/Physiology from the University of Manchester and an MPhil in Bioscience Enterprise from the University of Cambridge. Angelika von Heimendahl, MRCVS is Cambridge Animal Health’s Chief Veterinary Officer. Angelika is a graduate of both Agriculture and Veterinary Medicine from the University of Berlin, who initially specialised in cattle reproduction, particularly embryo transfer and in vitro fertilisation, before changing species to small animals. She was a Resident at the Royal Veterinary College, University of London for three years and became a Diplomat of the European College of Reproduction in 2003. Angelika runs her own small animal referral practice in Cambridge, and teaches undergraduates, veterinary surgeons and veterinary nurses. Angelika was the President of the European Veterinary Society for Small Animal Reproduction (EVVSAR) in 2010/11. John Ridley, PhD is Cambridge Animal Health’s Director of Business Development. John is also the Business Manager at Metrion Biosciences in Cambridge, UK. Prior to working in Business Development, John was a Senior Scientist at Xention Limited, where he was involved in the discovery of ion channel blockers for atrial fibrillation, neuropathic pain and autoimmune diseases. He holds a PhD in cardiac electrophysiology from the University of Bristol and an MPhil in Bioscience Enterprise from the University of Cambridge. According to the ACC&D, it is estimated that there are approximately 150 million owned dogs and cats in the United States alone. This figure rises to over 400 million in the 12 top countries (see Figure 1). The prevalence of neutering pets varies from country-to-country, but in the United States almost 80% and 90% of dogs and cats are neutered respectively. A recent review compiled by the ACC&D included reference to a study that stated the total annual cost of performing surgical sterilization procedures in the United States is $2.9 billion. The most common sterilization/neutering approach for cats and dogs used worldwide involves the surgical removal of the sexual organs (gonadectomy). There are advantages to gonadectomy, which include the fact that it is permanent, it is suitable for cats and dogs of both sexes, it can modulate undesirable sexual behavior and can reduce the risk of various cancers. However, it is also associated with some significant disadvantages, such as being an inhumane, painful procedure that requires anaesthesia and a long recovery period. Additionally, there is a risk of surgical complications, infection and urinary incontinence. From the perspective of animal welfare charities and wildlife conservationists, the inability to rapidly use this approach in the field is also a significant drawback. Whilst there are a number of non-surgical alternatives to controlling fertility in cats and dogs, they all possess significant limitations (see table 1). In particular, there aren’t any approved non-surgical methods of permanent sterilization that are effective in both male and female cats and dogs. Cambridge Animal Health will revolutionize the way that animals are sterilized/neutered by developing a non-surgical immunocontraceptive that will address all of the significant limitations associated with surgical sterilization and the current non-surgical fertility control approaches. Table 1: Overview of the advantages and disadvantages of current fertility control approaches. There are huge populations of unowned cats and dogs in many countries throughout the world that are involved in the transmission of zoonotic diseases. It is estimated that there are approximately 105,000 unowned dogs in the UK and up to 30 million in India. Furthermore, it is estimated that there are approximately 70 million and 10 million unowned cats in the US and UK respectively. These unowned populations represent significant reservoirs for zoonotic diseases that can pose a serious health issue to humans and other (often endangered) wildlife. It is reported that over 55,000 people die every year from rabies and the disease costs the global economy $124 billion every year. 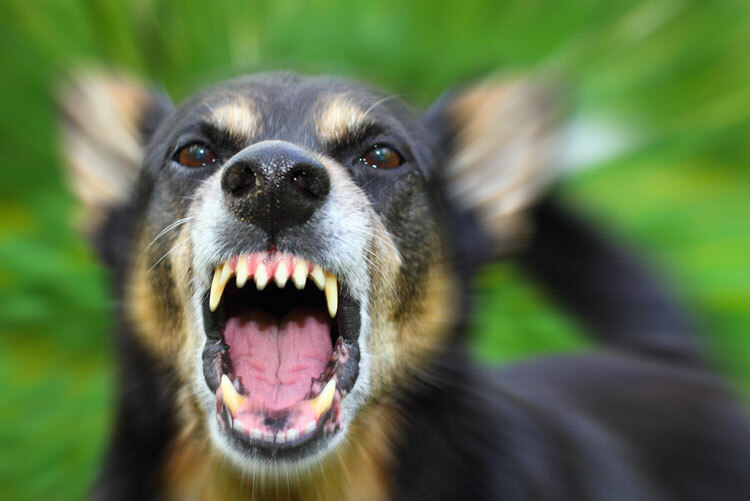 The majority of rabies cases are transmitted by feral dogs and 40-60% of fatalities are children under 15 years of age. However, rabies can also have a detrimental effect on other species. For example, rabies outbreaks in the 1980’s and 1990’s produced significant declines in African wild dog numbers in the Serengeti-Mara ecosystem. According to the WWF, The African wild dog is one of the world’s most endangered mammals, which highlights the requirement to reduce rabies burden for humans and other susceptible mammals. Canine distemper is a viral disease that affects a wide variety of animal families, including domestic and wild species of dogs. The virus is considered to be responsible for the near-extinction of the black-footed ferret and partly responsible for the extinction of the Thylacine (Tasmanian tiger/wolf). Furthermore, tigers in Sumatra, India and eastern Russia have been reported to be dying from canine distemper transmitted by feral dogs. Toxoplasmosis is an infection caused by a parasite called Toxoplasma gondii (T. gondii), which can affect a wide range of mammals including humans. The only known definitive hosts for T. Gondii are members of the cat family. The parasite is transmitted by the release of millions of oocysts that are shed in the cats' faeces for the first few weeks after infection. Intermediate hosts (birds & rodents) become infected after ingesting material contaminated with oocysts, which is then transmitted back to cats that become infected after consuming the infected intermediate hosts. A number of marine mammals have been discovered to be affected by T. gondii. For example, toxoplasmosis is a major cause of mortality and contributor to the slow rate of population recovery for southern sea otters in California. 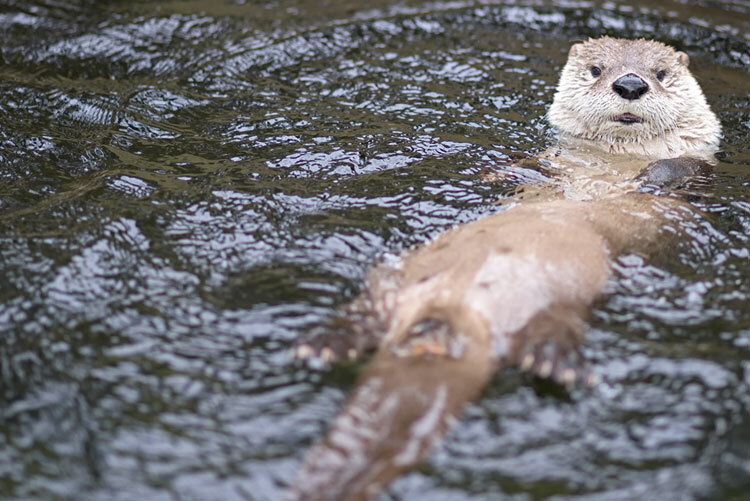 Dead sea otters collected from 1998 to 2004 found toxoplasmosis was the cause of death for 13% of the animals and 70% of otters are reported to be infected. The most likely source of infection is by environmentally resistant oocysts that are shed in the faeces of felids and transported via freshwater runoff into the marine ecosystem. Vaccines can be administered to animals, including pets, and have been effective in reducing disease transmission in some countries. Large disease reservoirs can initiate outbreaks, but culling is inhumane and ultimately ineffective. Surgical sterilization is ineffective for long-term management because it is too slow. A non-surgical approach is considered the most cost effective way to control feral dog populations and reduce transmission of diseases such as rabies. Safe, effective vaccines can be used for pre-exposure immunization. It is estimated that there are approximately 70 million and 10 million unowned cats in the US and UK respectively. The domestic cat (Felis catus) is in the top 100 most invasive species and is considered to be responsible for the extinction of numerous mammals, reptiles and at least 33 bird species. For example, feral cats are responsible for the extinction of six endemic bird species and over 70 localised subspecies in New Zealand alone. Alarmingly, free-ranging domestic cats kill 1.3 - 4.0 billion birds and 6.3 - 22.3 billion mammals annually in the US alone. It is estimated that unowned cats are responsible for ~70% of cases. There are many projects aimed at reducing unowned populations of cats, which involve trapping, neutering and releasing (TNR). However, the current favoured surgical sterilization approach is too slow to be effective, which highlights the requirement for an effective non-surgical immunocontraceptive that can be administered efficiently in the field. The reproductive cycle in mammals is controlled by the tightly regulated and concerted actions of a number of hormones. The cycle is initiated in the hypothalamus (a region at the bottom of the brain), which releases Gonadotropin Releasing Hormone (GnRH). This hormone is released in a pulsatile fashion into the bloodstream where it travels a short distance until it binds to receptors on the surface of special cells (gonadotrophs) located in an adjacent part of the brain, called the pituitary gland. The activation of the receptors on the gonadotroph cells leads to the release of Luteinizing Hormone (LH) and Follicle Stimulating Hormone (FSH). These hormones travel in the bloodstream to their receptors, which are primarily located in the ovaries and the testes where they have gender specific affects. In females, an acute rise of LH triggers ovulation and development of the corpus luteum, whilst FSH initiates follicular growth, specifically affecting granulosa cells. In males, LH stimulates Leydig cell production of testosterone, whilst FSH stimulates primary spermatocytes to undergo the first division of meiosis, to form secondary spermatocytes. The testes and ovaries release testosterone, and oestrogen and progesterone respectively. 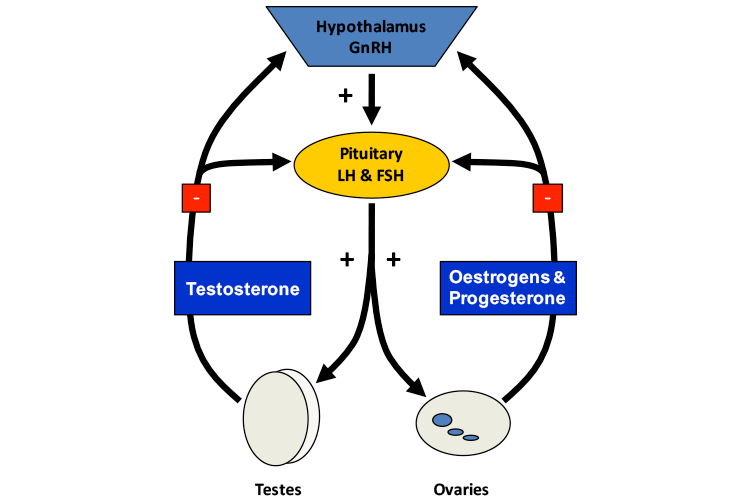 These hormones are responsible for driving reproduction-related behaviours and also produce a negative feedback effect on the hypothalamus, thereby reducing the release of GnRH. Cambridge Animal Health will develop an immunecontraceptive that permanently switches off the reproductive hormone cycle. This will prevent treated animals from reproducing and will also have additional positive effects on health and undesirable sexual-related behavior (outlined in the opportunity section). Cambridge Animal Health has already undertaken a pilot study to validate the immunocontraceptive approach as a viable alternative to surgical sterilization. This pilot study involved testing an immunocontraceptive that targeted GnRH in a fertility assay in male and female mice. 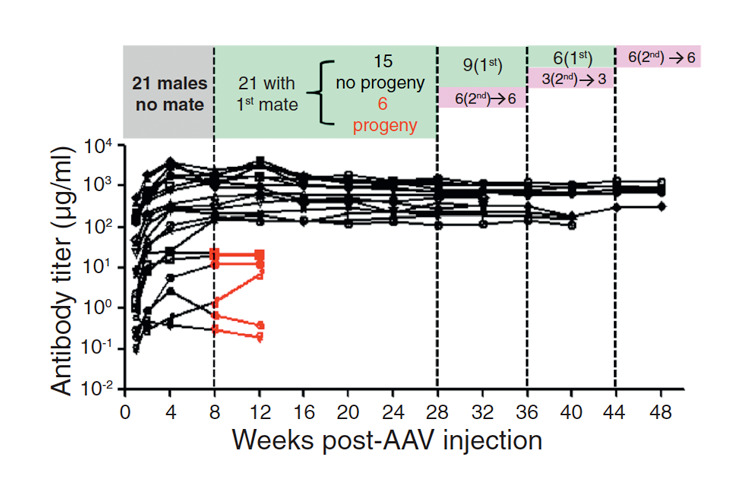 Figure 3: Anti-GnRH antibody titers in male mice injected with the anti-GnRH immunocontraceptive. Red line segments indicate four-week intervals during which a partnered untreated female became pregnant; black line segments indicate intervals during which no births occurred. Vertical dashed lines indicate points at which treated males were introduced to new breeding partners. The number of males maintained with either the first female mating partner (1st mate, green regions), or a second mating partner (2nd, purple rectangles), is indicated. Some sterile males were euthanized for histology at weeks 32 and 40.